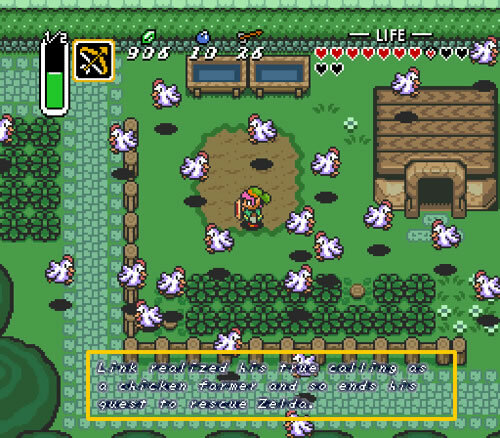 What if Link never made it to the end of the game because he became so enamored of the chickens? I know I like those crazy chickens. Played with Fireworks for this one. Found the image somewhere online and added a Zelda font with a little glow. This entry was posted in DS106 and tagged DesignAssignments, DesignAssignments172, ds106, visualassignments, VisualAssignments194 by Nikkapotamus. Bookmark the permalink. What Link doesn’t know: the chickens can never be tamed. Alan, I’ll let you in on a secret; I didn’t play it either. But I’m married to a man who loves to play video games. …um, I meant omg. Not that I usually say stuff like that. Harumph. Also, super disappointing to see all the other comments admitting ignorance. A Link to the Past is still my favorite.